Mitt Romney’s 47% remark drew a lot of attention, perhaps revealing an uncharitable, grudging attitude but it does inevitably bring us around to seeing a quality we all possess: generosity of spirit. Generosity, as a mental, emotional letting go, means releasing the tenacity of holding on to things. Baggage, all that heavy stuff we burden ourselves with, is removed in one single act of generosity. What’s wrong with being generous; cultivating an inward disposition to give? A glad willingness to share what we have with others – why not? We have more than enough. Give it away. Ease the discomfort of being driven to fulfill that urge to ‘have’, a hunger created by always wanting more. All of it is gone when you’re generous. Brainstorm the word ‘generosity’ and you come up with loving-kindness, compassion, empathy, well being, freedom. You find gratitude, grace, honour, motivation, encouragement. Generosity is everything. It’s nature is to share, recycle, circulate; it can only be given, never taken. With generosity we can accept, we can share, we can forgive. Generosity leads to wisdom – the truth is without bias. There is an understanding of things as they really are. 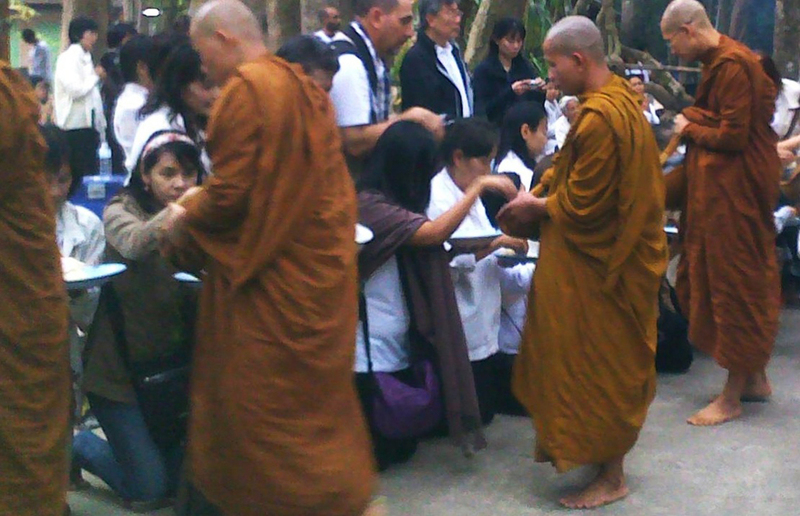 In Buddhism, generosity is seen as a way to counteract greed. It’s a way of helping others and a means of lessening the economic disparities in society. Generosity is part of Right View. The dhamma of generosity is a gift for all of society as we struggle for meaning in a world of dollars, logos, oil and military spectacle. 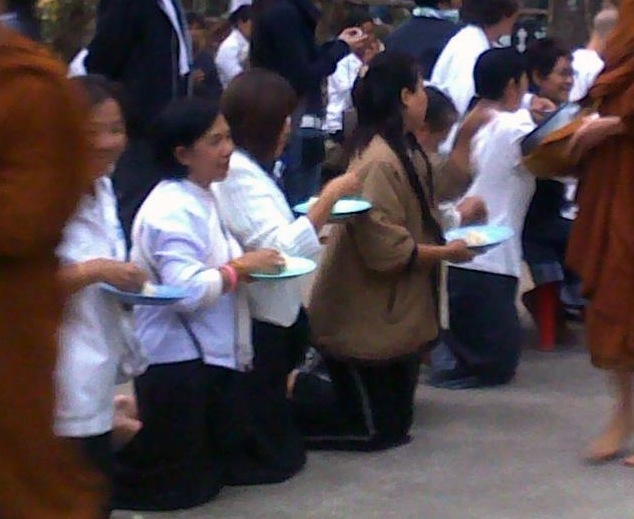 The dhamma of giving is a disinfectant, a gunk dissolver, an antidiote for the monetary values, brand names that clutch at our hearts. Mitt Romney making mileage (one way or another) from events in Libya? He’s saying all the wrong things. As a general rule, Right Speech is not something politicians are good at. Their intention is to get people to believe in an illusion. Probably not very different from how things were 2600 years ago. The Buddha’s Teaching on Right Speech may well have been introduced after hearing the politicians of his day manipulating the truth for all the usual reasons. And that’s why we have the Teaching on Right Speech. It’s called ‘right’ speech because language doesn’t stretch far enough to accurately express all the subtleties of how people communicate. The important thing is to get it right and I’ve used Mitt Romney here as an example of getting it wrong. 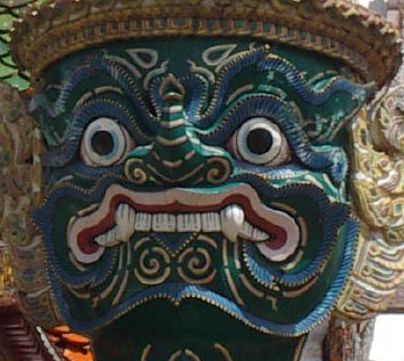 Photo image: Yakshas (Thai: Yak) are common as guardians of the gates in Buddhist temples throughout the country. The yakshas are the attendants of Vaiśravana, a beneficent god who protects the righteous. A small town in South India: I was walking through a quiet part of town. Not much going on, turn a corner and there’s this mother hen fussing around agitatedly with her brood of little chicks all going ‘chee-eep, cheep, cheep.’ And the hen is making loud cluck-cluck, cluck-cluck noises and strutting around, strangely fast, unusual body movements, like a dance. It didn’t look right somehow, the mother hen was dashing about and jumping backwards and forewards and the little chicks were falling over themselves trying to keep up with her. I stopped to watch and thought, wow, what is going on here? But mother hen had seen something ominous up there in the sky… and I was about to find out what it was. Suddenly there was what I can only describe as a huge SWOOP down from above. A large bird of prey with outstretched talons ‘dropped’ from sky to earth – must have been going at a tremendous speed – and in a great wide arc curved back upwards in the direction it had come. It needed space to do this and I saw it from further down the road sailing on upwards in the momentum of its fall, and up in this large curve, then winging it’s way back to the higher altitudes. Amazing. There was just this almost silent whoosh of feathers and outstretched talons – but it missed the chicks! It didn’t get what it was after, the mother hen had saved the chicks with her strange dance. She and her happy brood went on with their day. ‘Cheep, cheep’, story with happy ending. I was so glad to have been there and experienced it because afterwards it really, really cheered me up. The Great Bird of Prey missed it’s dinner, but the whole thing was a fortunate turn of events; cute little chicks with their lives all laid out in front of them, And, the thing is, it helped me a lot with a problem I was having with a little part time job I’d started. Something backfired, no proper contract; a breach in the proper way of going about things. Next thing I was unemployed. Then, to make matters worse, there was this irate person in the office who’d gotten the idea it was all my fault and no hope of convincing her otherwise. So it was just a case of skilful avoidance, dodging angry remarks fired at me like heat-seeking missiles. But the missiles were not hitting the intended target. I was untouched – not a hair on my head harmed, just like the little chicks that avoided the steel talons of the Great Bird of Prey. The mind would become transparent, a large empty space; nothing can hit it because there’s nothing there. I was able to see what was going on and yet be unaffected by it. The fierce eyes, the anger, the voice: the missile misses the target and all that’s felt is the wind of it as it goes by. What I learned from Ajahn is related to the teaching: sati sampajanna, clear comprehension and from that, the power of ‘wholesome’ thought – wholesome reasoning, or quiet focus. It’s the ability to look at any situation and “see” what it means (really) with alertness – no illusions, no assumptions – and monitor that ‘seeing’ with just the right balance of effort. Having ‘seen’, it’s possible to know that it is ‘mind’ that is the threat and the threat can be diverted from its course by kamma of Right Intention. It’s understood in a moment and after that the system does it all by itself. The simple power of all that is wholesome and correct in the world is sufficient to shield against the attacks from mind (it’s not a mine field, it’s a mind field). When I think of it now, I can see the fixed hovering of the bird of prey, suspended in the air. When I’m not thinking about it, it’s not there. Some things are just like that. ‘Footfalls echo in the memory. Down the passage which we did not take.